Denmark’s royal family is much loved by the Danes: they have 82-92% approval ratings, which is partly to do with their humility – apparently it’s not unusual to literally bump into prominent members of the royal family in the streets of Copenhagen (I’ve seen a photo of the Crown Princess cycling her children to school in the snow). And actually, the Amalienborg Palace goes some way towards showing that this generation of royals isn’t the first to have a ‘normal family’ vibe to them – it’s in the genes. The Royal Guards on the march in Amalienborg Palace Square, Copenhagen, Denmark. They change posts every two hours, and have a complete change of the guard every day at noon. These (incredibly young looking) men belong to the Royal Life Guards, founded in 1658, which serve as both a combat unit and a ceremonial guard unit for the royal family. While on guard duty, they wear bearskin headdresses and dark blue tunics, whereas on special state occasions they wear the ceremonial uniform, which has a scarlet tunic. The Amalienborg Palace consists of not one, but four buildings, around the Amalienborg Palace Square. These were originally palaces for aristocrats, built in the 1750s by the architect Nicolai Eigtved. They look the same on the outside, but the levels of grandeur and taste on the inside were different, reflecting the more personal tastes of their occupants. For example, the Moltke Palace, now called the Christian VII Palace, had an exceptionally fine Rococo interior (having had the most money spent on it). When the Christiansborg Palace burned down in 1794, the homeless royal family chose to purchase the palaces in Amalienborg Square, and within a few days, they’d moved in. Subsequently each of the palaces has served different purposes, accommodating various members of the royal family. As it stands, three palaces are not accessible to the tourist: the Christian VII Palace is used for official receptions and guests; the Christian IX’s Palace, where the Queen lives, and the Frederick VIII’s Palace which is now the home of Crown Prince Frederik and his family. The remaining building, Christian VIII’s Palace, is where we can catch glimpses into the lives of the royal family for the past 150 years, by letting us visit reconstructed rooms. It’s very cosy, which makes it rather easy to forget that you’re looking at the private living arrangements of monarchs. The first recreated room we visit belonged to Denmark’s most recent king, Frederik IX – father of the current Queen – who reigned from 1947 until 1972. He was an officer in the navy, which explains the paintings of ships and a funky ship’s wheel clock. The desk and pipes in Frederik IX’s Study, Amalienborg, Copenhagen, Denmark. Frederik IX was a great smoker, but in the 1960s he stopped smoking cigarettes, and took up pipes instead. A multitude of photos and paintings in Frederik IX’s Study, Amalienborg, Copenhagen, Denmark. The painting in the middle of the picture is of the Janiculum in Rome with St Peter’s in the background, 1951, by Tyge Bendix. Rome was a special place for Frederik IX and his wife, Queen Ingrid. They spent much of the their honeymoon in the city in 1935, and made an effort to return there every autumn, so they could enjoy each other’s company away from their responsibilities and family. Christian IX reigned from 1863 to 1906 and was the first king of the House of Glücksburg. This recreation of his study, originally in Christian IX’s Palace opposite, where the Queen now lives, shows a comfy room, dominated by photographs. The king was known as “Europe’s father-in-law” and all the photographs in the room serve as a reminder why. Denmark wasn’t one of the ‘great Empires’ and therefore the royal children made particularly good and uncomplicated spouses for the other royals of Europe. Of his three daughters, two became queens: Alexandra married Edward VII of Great Britain, and Dagmar married Alexander III of Russia. Of his three sons, two became kings – one of Denmark, the other of Greece. Many current royals are therefore descended from Christian IX, including both Queen Elizabeth II of Great Britain and her husband, Prince Philip, and the Kings of Spain, Belgium and Luxembourg. What is particularly sweet about the king and his wife is the fact that they wanted all their children to get back together in the summer. The family assembled in the country estate of Fredensborg Palace every year between 1880-1898, until the death of Queen Louise (there is a painting in Christiansborg Palace which shows the whole family together). Whereas Alexander III found it enjoyable to spend his summers in an unrestricted and simple place (he went mushroom picking and got muddy looking for tadpoles), Edward VII disliked being in the middle of nowhere. And he hated the simple breakfasts. But then, he was happier visiting the Moulin Rouge in Paris, so it’s not really surprising. The most important thing, I’d have thought, was the fact that their wives, who had to live so far from their parents and each other, got to enjoy a few weeks in each other’s company. Photograph showing the study as it looked in 1906, after the death of Christian IX, Amalienborg, Copenhagen, Denmark. His children asked the photographer Julie Lauerberg to take pictures of the rooms after the King’s death. Another photograph showing the study as it looked in 1906, after the death of Christian IX, Amalienborg, Copenhagen, Denmark. His children asked the photographer Julie Lauerberg to take pictures of the rooms after the King’s death. The next room belonged to Christian IX’s wife, Queen Louise. This was also originally in Christian IX’s Palace opposite, where the king’s rooms were on the ground floor, and the queen’s on the one above. While the feel of the room is more feminine, it also shows that Louise shared her husband’s fondness for trinkets and paintings/photographs. Entering Queen Louise’s Salon, Amalienborg, Copenhagen, Denmark. The grey satin sofa with matching armchairs had wheels under the legs so the Queen could move the chair freely around the room. The porcelain chandelier in Queen Louise’s Salon, Amalienborg, Copenhagen, Denmark. It was given as a gift to the royal couple by the German Emperor Wilhelm II for their golden wedding anniversary in 1892. It’s a copy of a chandelier from 1768 at Neues Palais in Potsdam. A comfy nook in Queen Louise’s Salon, Amalienborg, Copenhagen, Denmark. I love the cushion with her name embroidered on it. Angel Lamp in Queen Louise’s Salon, Amalienborg, Copenhagen, Denmark. Christian IX’s Palace got electricity in 1892, so they obviously wanted to buy this awesome lamp. Makes electricity worthwhile. The next room you enter is a bit different from the others: it’s dominated by a model of Amalienborg and there are interactive bits and pieces for you to learn more about the palace complex and the area of Frederiksstaden. The room itself is simple, but very elegant, and it preserves its original 1750s rococo ceiling. And because I visited in December, they also had a cute, simple Christmas tree. The Dining Room, which is not very grand, has been preserved almost exactly in the style of Christian X and Queen Alexandrine, including preserving their furniture. They lived in this palace from 1899 until their deaths in 1947 and 1952 respectively. The decorative plates on the walls are among some of the wedding presents they received in 1898. Part of the Dining Room, Amalienborg, Copenhagen, Denmark. The plates were wedding gifts to Christian X and Queen Alexandrine in 1898, and this set was from Royal Copenhagen, showing motifs from the town of Randers and the surrounding area, where the King had spent time as a soldier. Just as the dining room we’ve just visited is practically as it was left almost seventy years ago, so is the study of Christian X. He died in 1947, so the room was kept exactly as it was then. Of all the rooms, I feel this is the one I could move into the easiest. I love the bookcases, the random objects, the neat spinning bookcases. It’s just very comfortable and clearly reflects the monarch’s varied interests as well as the usual family obsession for photographs. Christian X is most famous for his brazen resistance to the Nazis after their invasion of Denmark in 1940. Unlike other royals of countries invaded by Germany, Christian X refused to leave Denmark, and he would ride his horse through the streets, unaccompanied, which made him extremely popular with the people. He continued with this tradition until he fell in 1942 and basically became an invalid. Nevertheless, the daily rides had already become almost legendary, and led to the composition of a popular patriotic song, “Der rider en Konge” (There rides a King) which narrates the exchange between a foreigner asking how the King can ride without a guard, and receiving the reply that the hearts of the Danes guard the King. The King is also famous for helping to defend the country’s Jews subsequent to the Nazi takeover. He was against their being issued with yellow star of David, and recorded in his diary his conviction that if it was forced on the Jewish population, then it would be best if all Danes wore the star. A brave and moving stand, which the country was never called upon to implement, but then perhaps the threat of it made the Nazis think twice about facing this embarrassing and difficult threat of mass opposition. There is a story about the King wearing the Star of David, which is untrue, but is still apparently repeated by non-Danes. I found this interesting article which addresses some of the myths which emerged about Denmark and the King during the war: www.academia.edu. In this modern era of ‘fake news’, it also serves as a stark reminder about the nature of propaganda, whether it’s good or bad. The Costume Gallery exhibits – most of the time – clothes belonging to the royal family. In the hallway there is, I believe, a regularly changing range of everyday objects owned by the royals. This reconstruction of Frederik VIII’s Study is the most approximate of the palace. Many of the objects that were in the room were given away to family and friends after his death in 1912, but we get an idea of the mood he was going for. It is decorated in the so-called Renaissance Revival style popular in the 1860s, and lacks the intimacy of the previous studies we’ve seen. It also appears to have been the most political, in that the use of yellow and red in the room deliberately draw links with the old House of Oldenburg (whose colours they were), and the new House of Glücksburg as the kings of Denmark. Detail of the original curtains from Frederik VIII’s study, 1860s, Amalienborg, Copenhagen, Denmark. Despite daily use, they are still in good condition. The wallpaper, in Frederik VIII’s Study, Amalienborg, Copenhagen, Denmark. The wallpaper, or tapestry, is made from imitation gilt-leather – that is, it’s made from paper. The pattern is based on one dating from 1720 in Vemmetofte Kloster. While there aren’t many rooms to see, and while there isn’t much you can really get close to, I found the experience of visiting Amalienborg to be really fascinating. I felt that I got to know the royal family more personally than I would have expected, not least thanks to the warmth and charm of the endless family photographs. If you are interested in the royal family of Denmark, this is an unmissable place to visit – each of the studies are so personal that you really can come away with an idea of the personality of each. When I went in December 2016, there was a wonderful little exhibition on about the objects the royal family have in their attics, which you can read about here. 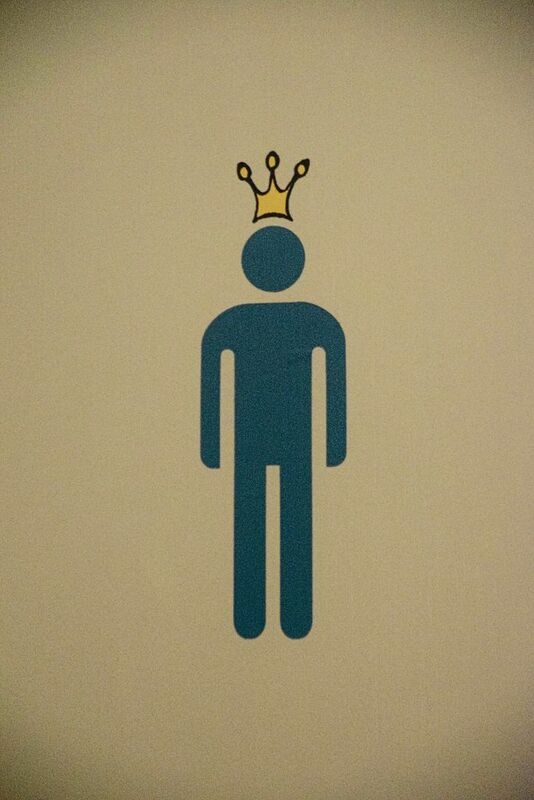 Then you can go to the toilets, and feel right regal.